A beautiful engraved square ring box. This amazing cream/ivory wooden ring box has a grey velvet lining and measures 50 x 60 x 60mm. 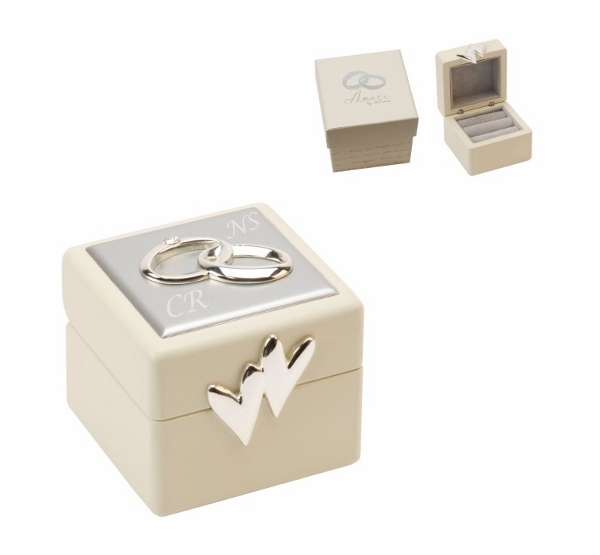 It has silver rings detail on the lid with one diamante and heart detail to the front of the box. It comes with a gift pouch and gift box. Due to the size of the engraving area we can engrave either initials or a date. The initials and/or date will be engraved on the top right and bottom left of the box (either side of the rings motif). Please provide your engraving requirements in the Customisation box. We will then engrave to your personalised requirements.